Dr Luke Lavan, Lecturer in Archaeology in the Department of Classical & Archaeological Studies, appeared on the BBC’s South East Today Evening News on Monday 14 January as part of a news story on the recent discovery of an ancient coin, which experts say is a significant find. 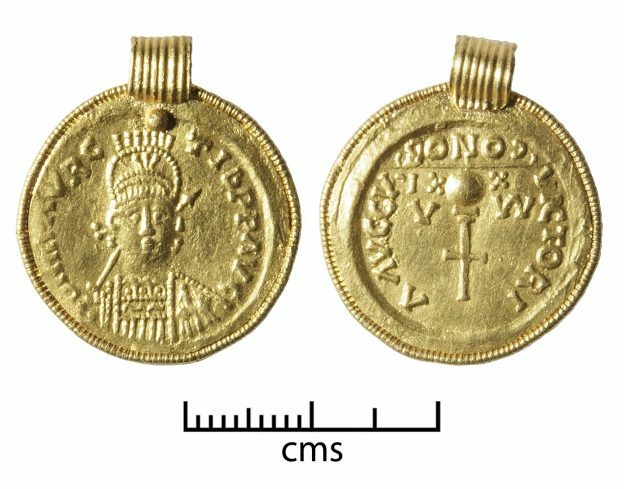 Regarding the discovery, Luke comments: ‘The coin is a Frankish imitation of a Late Roman gold coin, the solidus. Marks on the coin show it was minted in Marseilles. However it was struck to take the portrait of Maurice Tiberius, emperor in Constantinople from 582-602. A number of features show that it is an imitation, and not minted under Roman control: the obverse side has a high quality portrait of Maurice, which is based on an style brought in during the fourth century, that had not been used officially for many decades. The reverse stamp also contains elements which are upside down, along with the mint mark ‘MA’ for Marseilles, which appears alongside a cross on a globe. This entry was posted in Campus online on 17 January 2019 by Sophia Cheraitia.